Tiny, helpless, impressionable. They need their parents to teach them how to be who they are. My house is quiet this morning. For the second time in three days, I made a pre-dawn trip to a rendezvous point to drop off a child for a trip. The girl-child went on a mission trip to the inner-cities of Philadelphia, and the Padawan left this morning in a convoy of 41 buses to visit our nation’s capitol with the Safety Patrol. My chicks are making their test flights, stretching their wings and discovering the world beyond mom and dad. It’s exciting, it’s terrifying, it’s expensive. Since big brother and sister got to take big trips, Squish’s grandmother invited him to her house for some adventures of his own. He left last night. Suddenly my nest that was so cramped feels big. It feels empty. I’ve been reminded lately of how brief my time raising kids actually is. The oldest is a year away from being on her own. Today, with the house so quiet I can hear the refrigerator hum, I have a glimpse of what my life will be like in a few short years. It’s my day off, and I am alone. Now I am asking the inevitable question. What do I do when there is no one asking for a hug or a lightsaber duel, no one to take to the zoo or to the park, no one looking to me to meet a need? What do I do? And the answer is: Any ever-lovin’ thing I want. How about popcorn and a MoonPie for breakfast? We’ve talked about it for years. We both wanted to do it. We would do it. Someday we would pack our gear and get it done. On Saturday, someday arrived. 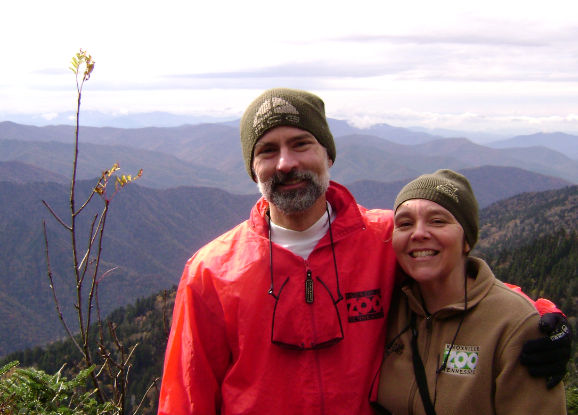 We hiked to the peak of Mt LeConte. For weeks prior, I was plagued by doubts. 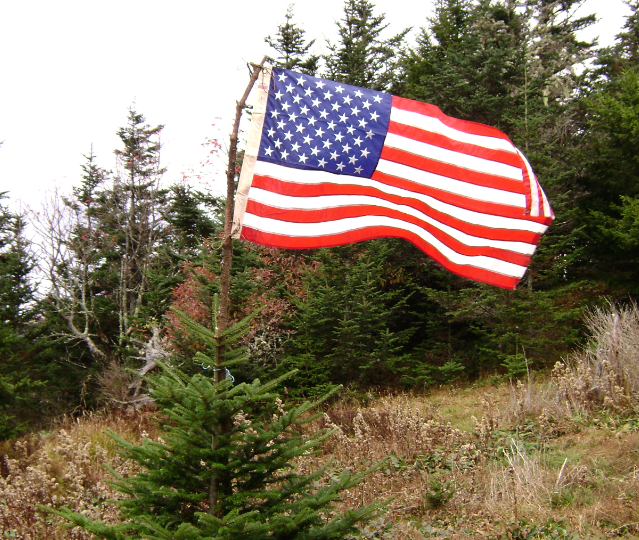 LeConte is the third highest peak in the Smoky Mountains. 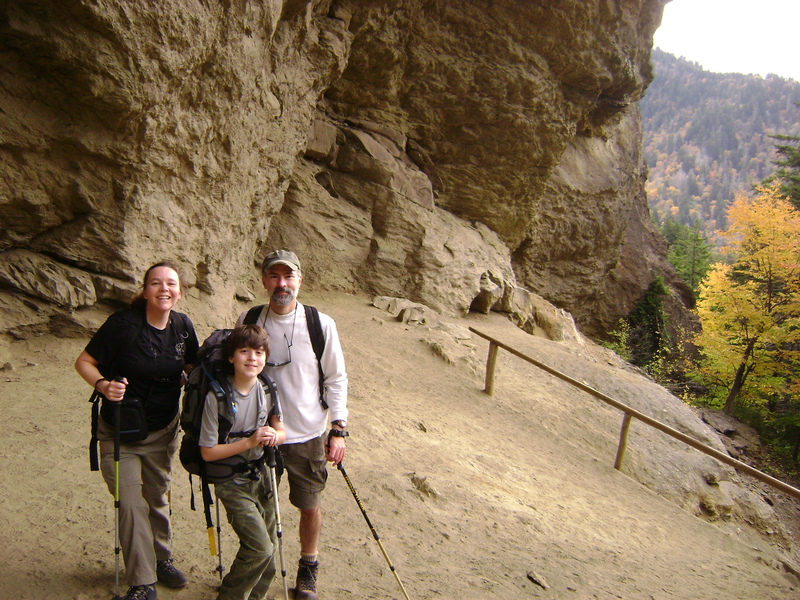 We’ve done the Alum Cave Bluff portion a year and a half ago, and I remember it being a real challenge. This time around, we would be in the company of the Padawan’s Webelos den. Would I be able to keep up with the kids? Would I be that mom who slowed the whole group down? I didn’t want to ruin it for my husband or my son, especially since our den leader had planned the whole trip so he could award the boys their Webelos rank at the top of the mountain. It was a big deal. Husband and I had some disagreements prior to stepping off the trail. I let him win on both counts, but I still resent it a little. He talked me out of taking my “real” camera, and I had to settle for my daughter’s point-and-shoot. He also balked when I packed my book in my backpack. “You’re not going to have time to read, and you’ll be sorry for the extra weight.” Yeah. I did, and I wouldn’t have. But whatever. On the way up, I couldn’t stop smiling. It’s not every day I get to cross something off The Dream List. The trail was so much easier than I remembered, maybe because I didn’t have a thirty pound preschooler dangling off my back this time. We got to Alum Cave much faster than I expected, and it was actually fun. It wasn’t a fear of heights that made our last trip so terrifying, it was a fear of Squish plummeting off the side of the mountain. No Squish, no worries. Yes, it’s as steep as it looks. We tagged about 1/10th of a mile behind the Padawan’s group, well ahead of the middle-of-the-pack. My husband and I hiked essentially in solitude. We talked. We are at our most honest on the trail. Being in the moment brings the things that matter into clearer focus. We can solve the world’s problems at 6,000 feet. As the path grew more difficult, the talking stopped, and our thoughts turned inward. We hit the top after just under three hours of hiking. Actually, we hit it sooner than that, but we missed the trail to the lodge and kept hiking another 1/4 mile before I realized our mistake and we got turned around. While we waited for the last group, we took a side trip to the actual peak. Please ignore the cheesy grin. Please? I must have framed a thousand shots that I did not take. The breathtaking peaks and valleys; tiny deer mice scurrying across the trail; tangles of tree roots spilling downhill like so much water; my husband, rosy-cheeked and smiling, mist hanging over the hills; my son grinning with the triumph of 11 conquered miles. I carry those images in my heart. Yep. That’s a fortune cookie, alright. The next day, this is what it looked like. That’s its tail. When I touched it, the turtle would curl its tail up. I think it’s ticklish. I would show you a photo of the finished product, but I can’t. Because there are eight of them now, and I have no idea which is which. Eight. I was pretty wrong. And there are still a couple of eggs that might hatch. We’re almost at 50% as it is. Not bad considering their story. Full to the top with cute? Ready for that to-go box? Coming right up. I want to stick it in my pocket and take it home. I won’t. No, really. Can you see that egg tooth.? It blows me away! Here’s your to-go box. Box turtle, that is. It hatched yesterday. It’s an Eastern Box Turtle, Tennessee’s state reptile. 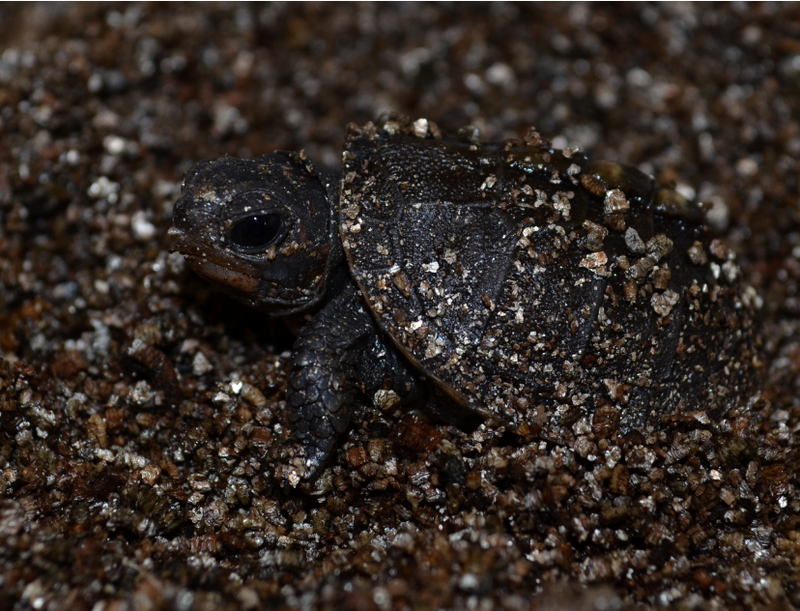 Its plastron is completely different from the snapping turtles’. You can see the beginnings of some yellow, though it may take a few years for real color to appear. Note how its yolk is almost completely absorbed. This post is for my friend, sj. I hope she knows why. All the purty turtles to you, sj! Happy Monday! You Won’t Believe This! Remember our little friend from Thursday’s post? It looked as though a handful of other eggs had the potential to hatch. Based on egg condition alone, I guessed there would be a total of six. I guessed wrong. The incubator has been busy. 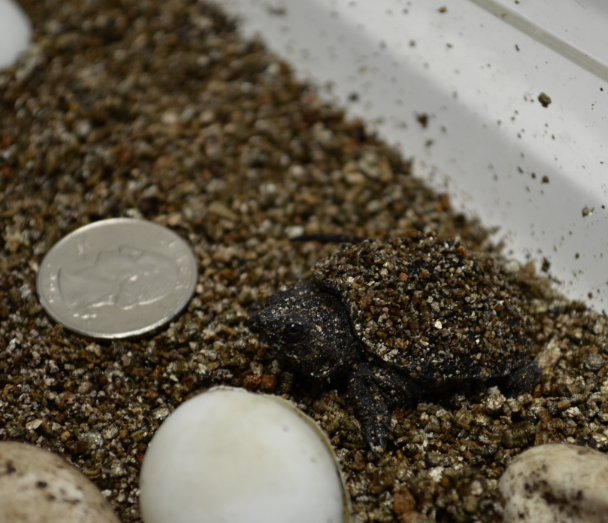 There are a few more turtles just waiting to hatch. Click to enlarge the photos. The broken at the bottom is evidence of pipping. I *really* hope this one hatches! Looks like my guess was too high, doesn’t it? Wait. Note the domed shell. That’s from being squashed in the egg. The turtle is actually very soft and squishy right now. Give it a few days and it will be a lot flatter. Overnight, three other turtles hatched, so we’ve got four that have completely emerged, and three others that are on their way. Plus any surprises that get thrown out there. If you only click on one to enlarge, click on the left. It is hard to appreciate the weirdness in a thumbnail. This is an amazing sight. The plastron is completely folded over, and the yolk sac is still hanging out. 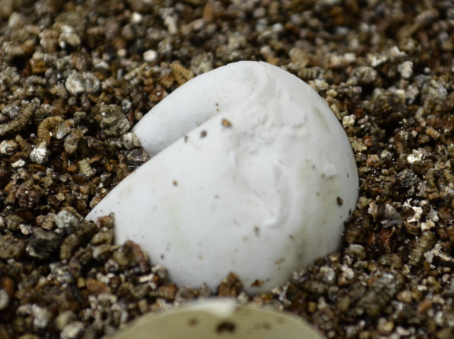 After a few days, the yolk will be completely absorbed, and for a brief time the turtle will have a belly button. The bulging yolk sac looks uncomfortable, but it hasn’t impeded any swimming. And let’s not forget this guy. Not coming out. Sorry. I like it in here just fine! Here’s an upclose and personal of his egg-tooth. He used that to shred the egg in order to make his escape. He looks like a little shark with that tooth. I’ll be watching the clutch with even greater interest over the next few days. Who knows what miracles will emerge? They now have water to swim in. Because that’s what turtles do. But he has some towels so he can haul out of the water if he wants to. Sometimes bad things happen. This summer, I have been able to watch as an unfortunate circumstance was made right. This summer, a female common snapping turtle, Chelydra serpentina serpentina, was struck by a car and killed while crossing a road. 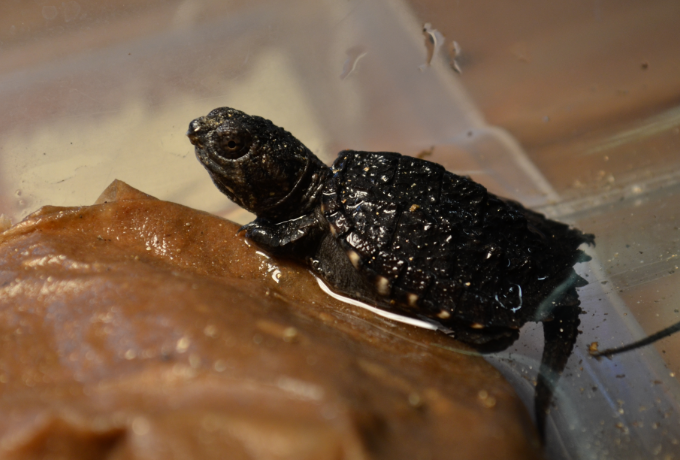 A quick-thinking observer picked up the turtle and took it to the local vet school. 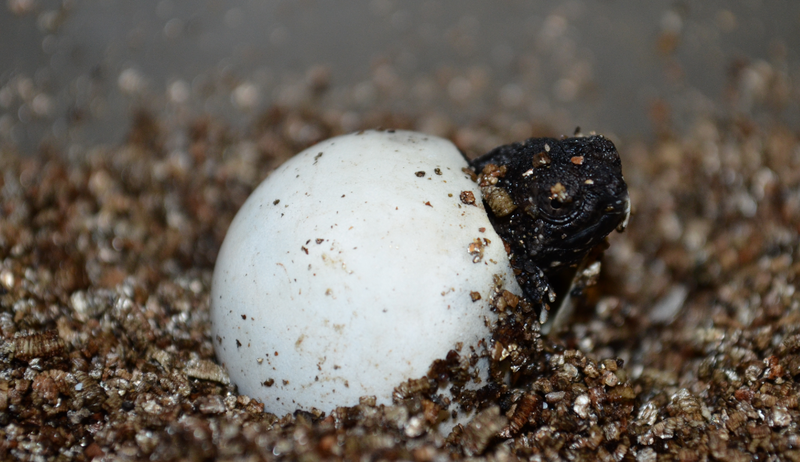 The turtle turned out to be a gravid (egg-carrying) female. Her eggs were promptly removed and were brought to the zoo for incubation. Snapping turtle eggs in early June. 19 eggs is on the low end of average. 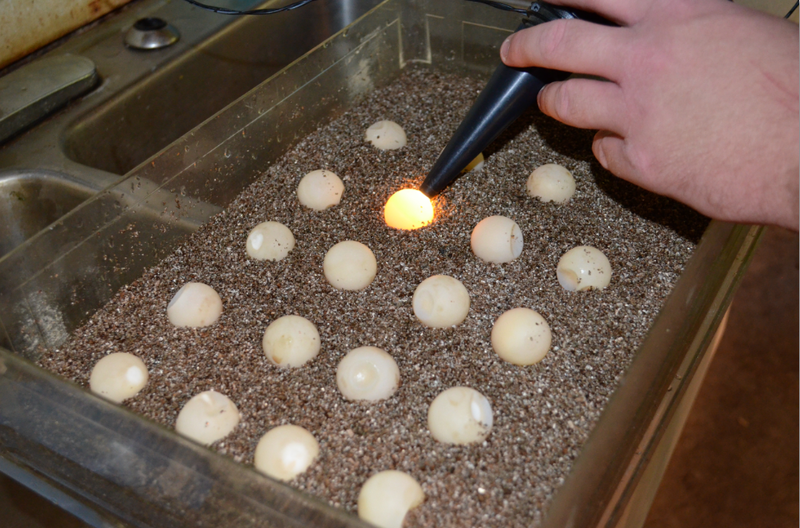 Incubating reptile eggs is a trickier business than hatching other critters. When the eggs are retrieved from a nest, they must remain in the exact position in which they were found. If they are turned, the embryos can separate from the egg and drown. They need to come with a giant “This end up!” sticker. I don’t have a lot of experience with turtle eggs. I’m a tortoise gal, myself. When I looked at these eggs, I didn’t have a whole lot of hope. So many of the eggs were dented, and those bright white spots are calcifications. Weird. But It have learned enough to know that we will always err on the side of caution. 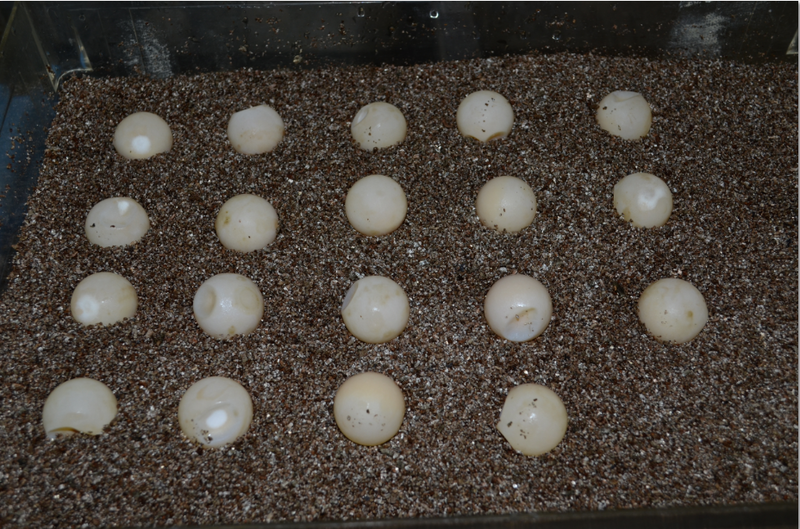 The eggs were carefully placed in vermiculite and set up for incubation. The eggs were also candled. 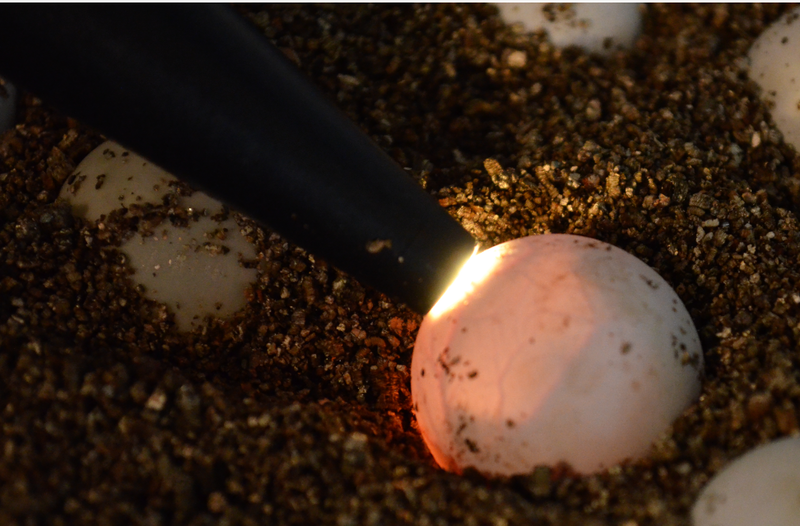 Candling is when a light is shined through the egg to check for any development. As expected, no development was noted. 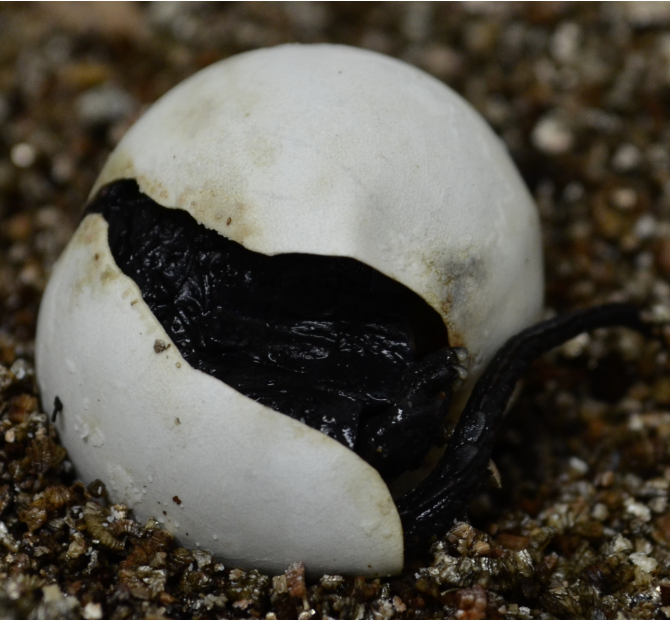 It would be very unlikely to see growth in recently-laid eggs, anyway, so the eggs were incubated with crossed fingers. A few weeks later, the eggs were candled again. Note the veins running through the egg. This egg is fertile! The shadow beneath is the developing embryo. Holy cow! Several of the eggs showed signs of development. Yesterday, I got an email telling me there was someone waiting to meet you all. Check him (her?) out! Yes, that’s a quarter for size comparison. 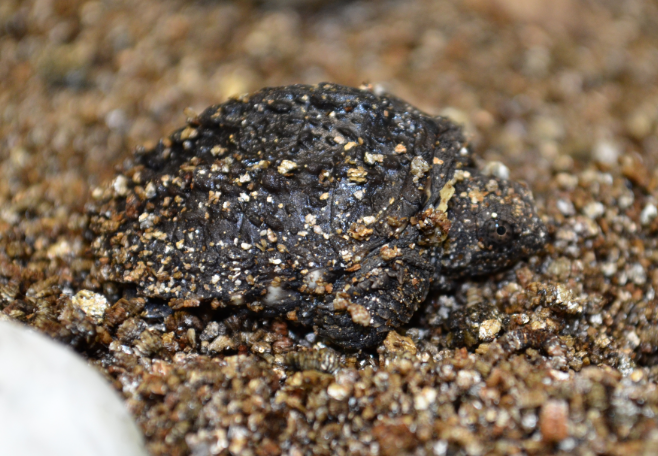 The turtle is covered with vermiculite. Once it has its first bath, seeing features will be much easier. Click to enlarge any of them you’d like to see more closely. Check out the wagon it’s draggin’! Tails are longer than their shells at this age. This one looks like it should hatch soon. It has a good shape and color. The jury is out on this one. My call is that it’s a bad egg, but I’m no expert. The color is good, and sometimes the egg will collapse as the baby absorbs its yolk sac, but that’s a lot of collapsing. Looking at the tray of eggs, I would guess there are at least five others that will hatch. How soon? Hopefully really soon. Once the babies have emerged, they will stay at the zoo only a week or two before they are released back into the wild. They know all that they need to know to survive. That’s where the hard-wiring has the advantage. 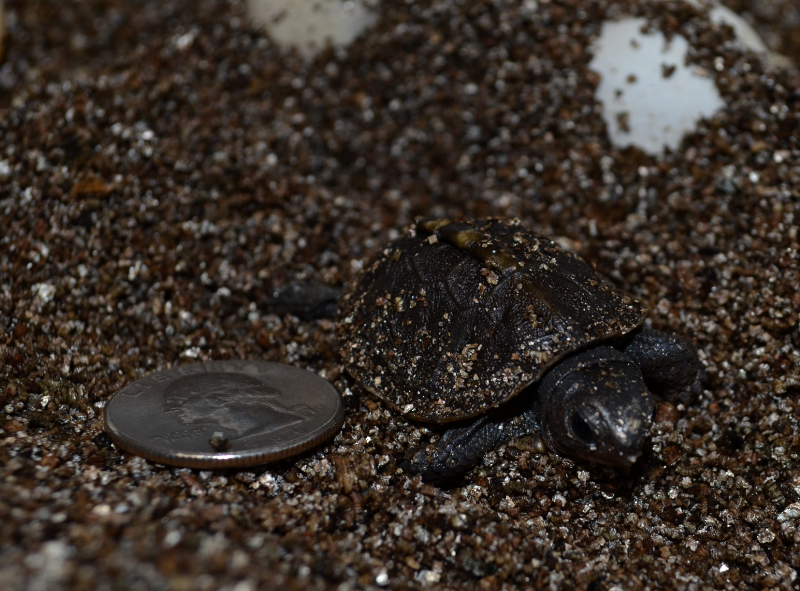 I hope to post updates and pictures of any subsequent hatchings.. Fingers crossed that a few more make it. About 70% of nests in the wild are lost to predation, so this little guy is ahead of the game, despite its precarious entry into the world. ***Turtles sometimes cross roads to get to and from breeding grounds. If you ever find a turtle walking across a road and want to help it, put it across the road in the direction it was facing. If you put it back where it came from, it will only turn around and head back to where its homing device is telling it to go. Also, don’t stop in the middle of a busy, busy road. You’ll both get squashed. I took this picture a little less than 2 months ago when trying out the new camera. Doesn’t look like much, does it? All wrinkly and pitiful. No, you’re not in the wrong place. It’s still a family blog. Look what I found yesterday in a cooler on my back porch. What a strange bundle of leaves. And a strange location. That’s a little soda cooler. A closer look? Okay, then. Click to enlarge. The gallery pics show up tiny, but the photos themselves have some great detail. I love my new camera! Note how the mother has lined the nest with fur. They look like tiny Thanksgiving turkeys. Note the unusual construction of the nest. It’s a cavity and on its side rather than the typical bowl-shape. 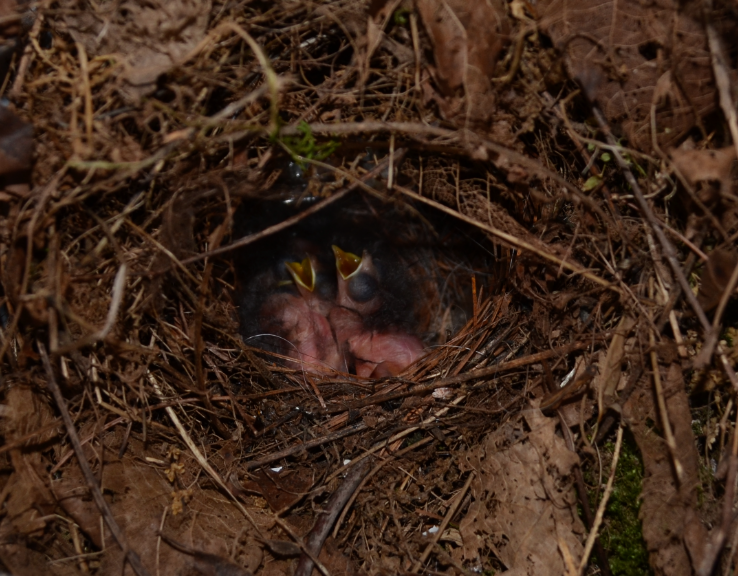 My mother has a great deal of experience with birds, and she believes that they have just hatched, and she’s probably right. 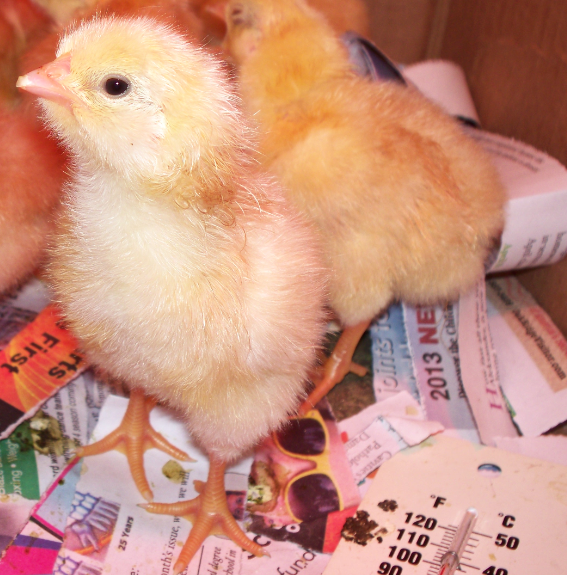 There’s not a single feather on these little nekkid chicks! I am trying to figure out the species. It’s a tiny one. I know because mother bird and I scared the poop out of one another, and she flew right by my head. 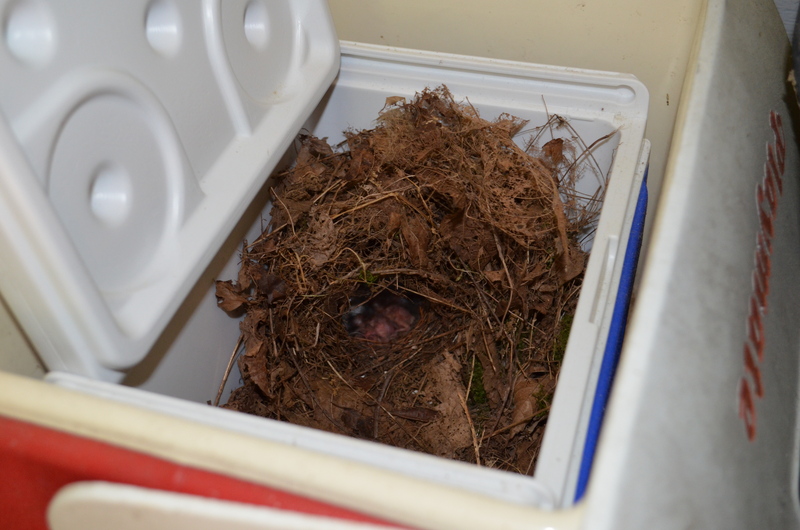 I love that she has built her nest inside a cooler. The temperature will stay nice and cozy without getting too hot. Who says they are bird-brains? And here’s proof that most birds have a poor sense of smell. I use that cooler to feed a snake. On a totally different note, I am preparing my first review post for our awesome children’s book club. It should go live on Monday. If you have already done a post about a favorite kids’ book, send the link to me so I can include it in the post. If you want to do one, include a link to Monday’s post somewhere in yours, and a link to your post will appear as a trackback. That way we can all find each other’s awesome children’s reads. Also, you are welcome to click the Goodreads widget in the right hand column and join the club On Goodreads. Until that site is completely taken over by Amazon Zombies same diff a huge, multinational corporation and we are forced to hold meetings in my playhouse. I’ll make the gingerbread. Remember my best decorating scheme ever? Things are happening there. Click to enlarge. It’s insane! Is she being eaten by parasitic aliens? No, I think that lump is a LEG! Note how it’s eyes have moved to the top of it’s head. Four days later, she has shed her skin, leaving her tail looking like a Labrador puppy’s. She is absorbing the tail, and she gets nutrients from it, so she won’t eat until it is absorbed. The other tadpole. No real development here. For the moment, I’m calling it Pee Wee Herman. My kid has the coolest teacher. 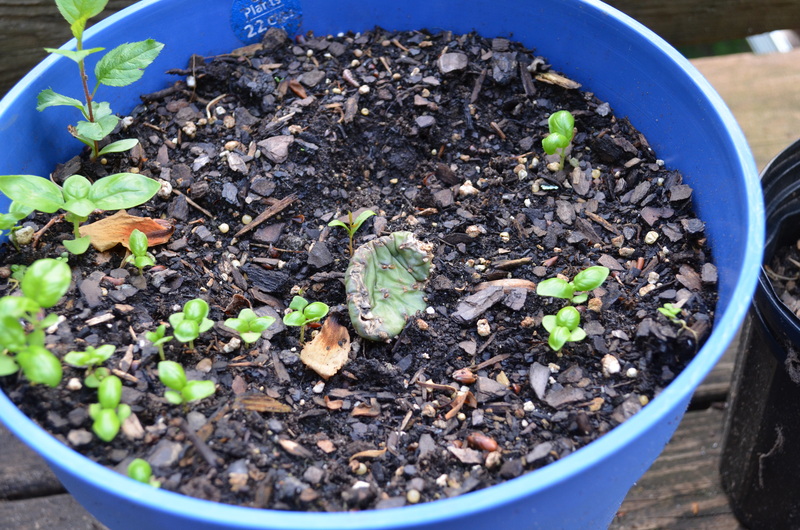 Look what else is growing in her classroom! Note the egg tooth on the end of its beak. The kids got to watch them hatch, too!